Dover is one of those pleasant “small city” capitals, with a stable economic base and a rich history. The setting in a flat, mostly agricultural area is idyllic without being too far removed from larger northeastern cities. The nearby Delaware Bay and its beaches and wildlife areas provide ample recreational opportunities. The Dover International Speedway (NASCAR) and the Dover Downs harness racecourse add to entertainment options. Aside from the state government, Dover Air Force Base is a major employer, as is rubber and plastic apparel manufacturer Playtex. The area is growing as people mainly from more crowded East Coast cities seek a slower and less expensive pace of life. Cost of living is attractive, and the Delaware tax climate is favorable especially for the East. However, there is a high violent crime rate, and educational attainment is not as strong as seen in other capital cities. Dover lies in a flat plain separated from the Delaware Bay but has areas of level marshland. To the west and south are areas of level to gently rolling terrain used mostly for agriculture and dairy farming. The influence of the Atlantic and Chesapeake Bay create a climate that’s mild for the region. Summers are warm and humid but with maximum temperatures seldom exceeding 80 degrees. Clouds are common, and humidity and moist Delaware Bay winds can cause fog year-round. Winters are usually mild, with temperatures seldom dropping to 0 degrees. Most winter precipitation occurs as rain or a mix of rain, sleet, and snow. Summer thunderstorms are common; occasional downpours from Atlantic hurricanes can cause lowland flooding. First freeze is late October, last is mid-April. The median home price in Rising Sun-Lebanon is $268,200. Browse Homes in this Range. 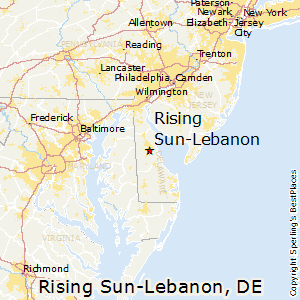 Compare Rising Sun-Lebanon, Delaware to any other place in the USA.